In late February of this year, just one month after millions of people around the world took to the streets for the International Women’s March, 19-year-old Margo Hayes sent “La Rambla,” a famed sport route in Siurana, Spain. The route was a personal best for Hayes, but for the greater climbing community, it was even bigger. The moment she clipped the chains, she became the first woman to successfully climb a confirmed 5.15. The days of 5.15 being a male-only number grade were over. The achievement was celebrated widely by the climbing and outdoor communities. A post-send photograph of Hayes looking as joyful and teary and awestruck as one would assume to appear after achieving a major milestone for womankind circulated widely across social media. I, along with thousands of other people, shared the photo on my Facebook wall. Within moments, I received a surprising comment on the post. “I just don’t get the hype. Dudes have been climbing 5.15 for years.” It was a shock. I thought that maybe this person was just trying to get under my skin, but as I scrolled around social media, I noticed similar comments occasionally littering the otherwise party-like atmosphere of my newsfeed. “Dudes” have in fact been climbing the grade for quite some time now, with the first 5.15 established by Chris Sharma in 2001. Since then, at least 50 men have sent 5.15. While women such as Ashima Shiraishi and Josune Bereziartu have come very close to the grade, Hayes is the only woman to climb a solid, confirmed 5.15—for now. Climbing grades were created by men and, for the most part, they are still upheld and maintained by men via route development, first ascents and route setting in gyms. Climbing media and culture also favor men by representing, sponsoring and supporting males at a higher frequency than women. 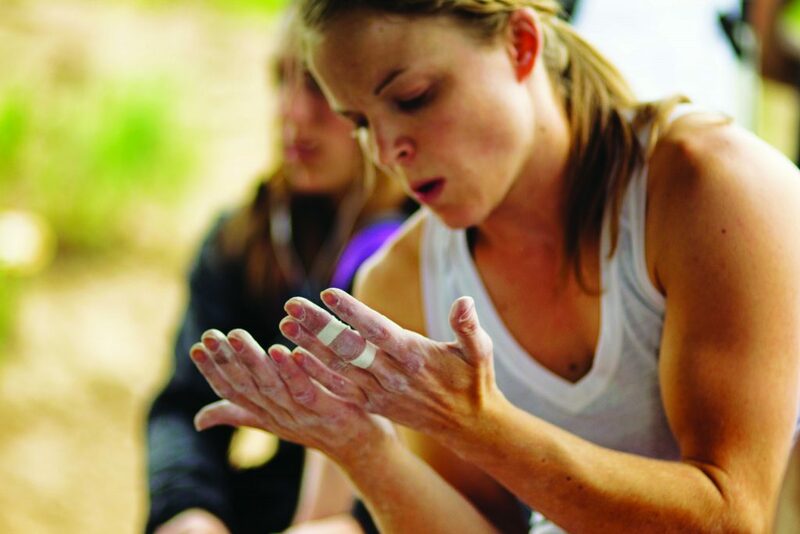 Believe it: Only 29 percent of sponsored climbers are women. This means that in order for a female climber to perform at a high level, she must possess or mimic traditional male characteristics. There is nothing at all wrong with this, as some women find joy in taking on male roles or character traits—and female climbers who fit into the male-generated idea of what being “strong” means will most likely send the hardest grades. However, even when a woman climber trains to fit into this box, this does not automatically guarantee that she will perform at a high level. Women climbers not only have to fit into a male-determined idea of what “strong” means, but they also must deal with systemic oppression, social conditioning that tells women that their worth is based on their looks, that they recieve lower pay than men and so on. Female athletes in particular receive massive scrutiny, largely focused on their appearance. Women climbers are not immune to this, as it is not uncommon for a brand to introduce their new female athlete as a “young, pretty face,” as if there was nothing more there. While some women, such as Margo Hayes, find joy and success in the male-dominated and determined world of rock climbing, other women do not. For years, female climbers have been begging brands and media makers to represent a wide variety of women accurately, equally and with respect. Women have gone about doing this in a variety of ways such as writing letters and emails, but mostly they are expressing their frustration on their own social media pages and blogs. After their requests to be treated and represented equally went unheard and were even laughed at by some industry professionals and media makers, they recently decided to take the matter into their own hands. In the last few years alone, the sport of rock climbing has seen the birth of women’s climbing festivals, women’s outdoor empowerment summits, women-run businesses, women-specific content and information, women’s climbing events, women-specific brands and thousands of women’s-only social media groups and pages. Female climbers are creating these new spaces within the sport for themselves from the ground up—often without help or resources from big brands. Perhaps the most heartening aspect of this movement is that women of different backgrounds—not just white women—are creating spaces for themselves and fiercely claiming the sport as their own. When social change comes from the top—via politics, lawmaking, brands or media, it often focuses solely on the issues of white women. But when it comes from the ground up, that is, from individuals, the needs of many more people can be addressed. What’s happening in the climbing community right now is multi-faceted and, for the most part, intersectional. This is not coming from the climbing industry. This is happening because individual women are claiming the sport as their own. 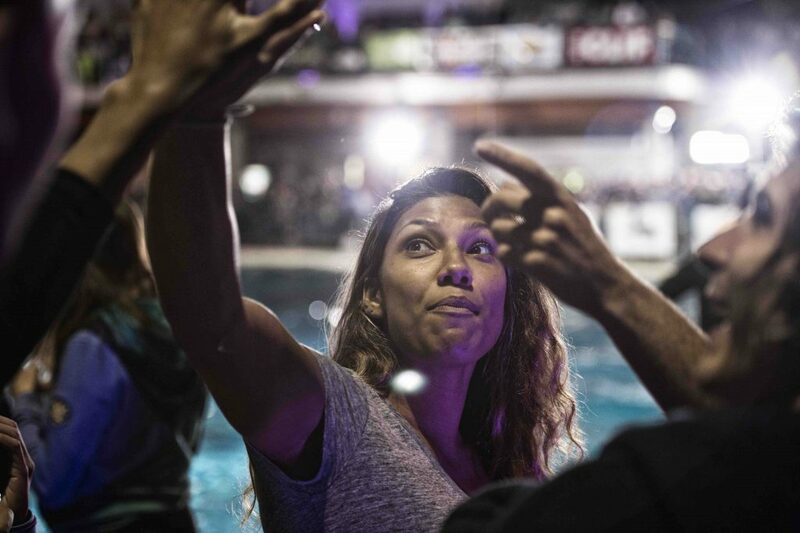 For example, Bethany Lebewitz created Brown Girls Climb, a group that was created to share and encourage diversity within the climbing community. Women climbers who are black, latina, trans, Native American, queer, Deaf, mothers, para-athlete and more, have all hand-crafted positive and empowering spaces for themselves in the sport of climbing. These new spaces are giving women what the industry and has largely refused them—representation, information and most importantly, a new way to define success in rock climbing. In my experience, women’s climbing communities celebrate two distinct types of success—one, moments like Margo Hayes sending “La Rambla,” and two, a new type of triumph that the climbing world hasn’t yet seen in mainstream media. Women are not just celebrating the first female 5.15, but they are also celebrating their first lead after having a baby, their first solo-trip, their first trad lead and most notably, they’re celebrating each other. Community is the theme that is woven throughout all of these diverse women’s climbing groups, and the support that comes from this has acted as a foundation for women to approach climbing in ways that they never have before. Margo Hayes’ send of La Rambla coincided with a powerful, grassroots feminist movement in rock climbing. Not only are many women succeeding in rock climbing’s male-paradigm, but they have also created a system of their own, where personal growth, exploration and friendships are celebrated. Women have hand-crafted their own space within this sport, measuring success in new ways, and, despite the many challenges they face when entering into the traditional climbing spaces, women are crushing there, too. A new generation of women climbers is emerging. They’re smart, scrappy, kind, funny and open-hearted. Most important, they know how to climb like themselves, whether that’s climbing with the guys or creating rules of their own. And that’s definitely something worth celebrating. Georgie Abel is a yoga teacher, writer and rock climber based in california. follow her adventures on her blog, georgieabel.wordpress.com. 1) What is a sponsored climber? This is a well-beaten horse, but the term is very broad these days and makes me wonder whether the composition of semi-sponsored/team members/friction labs recipients demonstrates similar bias. 2) What is the gender composition of climbing as a whole (ie. is the 50/50 assumption accurate)? From experience in gym and canyons, I’m wondering whether 29% is relative to target audience/market share. 3) Is there an inexhaustible pool of zeal? Does celebrating personal achievements (say first sport lead) and mainstream achievements (say 5.15a FFA) create any sort of dilution effect? I think your article misses two big factors as to my more women are not crushing 5.15 right now. All other points about sexism in climbing aside these can be broken down to simple numbers. 2 – In basically any sport when you get to the world class best of the best and try to measure everyone equally, men more often than not come out on top. This isn’t universal sexism it’s simple biology. For the vast majority of us differences between the sexes physically matter very little. How many women can out climb and out run me? Millions for sure. But, when you bring this to the peak performers of any sport that comparison can’t be made. This is also a key reason why the olympics still have men and womens events for the same sport. Lets take another skill where the playing field can be made completely even…. running. With running everyone runs on the same track or same course and the only thing that matters is who crosses the finish line first. I’d argue this is more representative of the difference between men and women physically than climbing as with climbing you can factor in routes with big moves, short moves etc. Now, with running the current official world record marathon is 2:02:57 by Dennis Kimetto for women this is 2:15:25 by Paula Radcliffe. This can be carried across all distances too. So yes, for the vast majority of us biology doesn’t matter for who can climb the hardest. But when you get to the peak possible difficulty in a sport you will see this play a major role. This is before even factoring in all the difficulties in agreeing on what 5.15 is first. If this route is 5.15 for 10 women and 5.14 for one man because he is 6’6 and can skip the crux how hard is the route? How many possible 5.15’s exist in the world? Is there enough steep rock of good enough quality and few enough holds that is possible to be climb to actually create enough variety in 5.15s to allow equal number of men and women to climb the grade? Talk to me in 2050 and we might know these answers . Such an important point. But why do the images in your article not reflect that? Why not try to include more diverse representations of women climbers in the article photos? We were aware of this contradiction and included more diverse photos in the print edition of this story. We have changed the images here, but most of all we regret that there are not more images out there of more diverse women climbing. We hope that we can do something to change that and we have planned on future stories that will highlight more diverse groups in the outdoors. We realize that we need to lead on that front in the best way we can. Thank you for the photo update and response!